Carrot Kheer was part of the North Indian Thali, which had too many similar vegetables used. I didn't realise until after doing the prepping. I was almost floored thinking why I on earth did I zero on the same vegetables. However having decided and made some preparations ahead, I couldn't change at the last moment. So I ended up grated carrots for two dishes, grinding cashew paste for two dishes, chopping capsicum for two dishes, methi for two dishes. 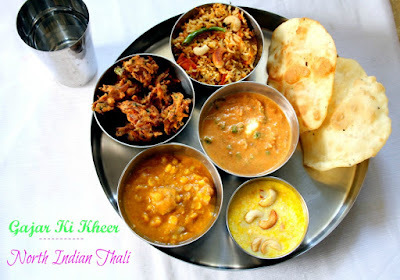 And these two dishes were not the same but five different ones. If you are up to getting maths right please feel free! Carrot Kheer recipe was from another paper clipping. 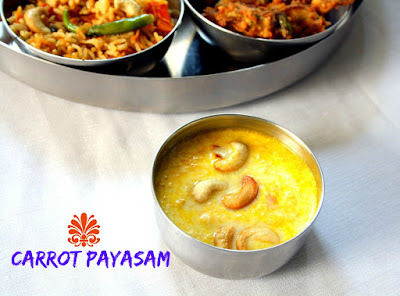 Since I really remember a payasam being made wit carrot in south, knowing that Gajar ka halwa, I clubbed this under North Indian recipes. This was pretty easy to make, provided you don't end up grating a lot of carrots. Having not many takers for sweet at home, I did just a small portion. 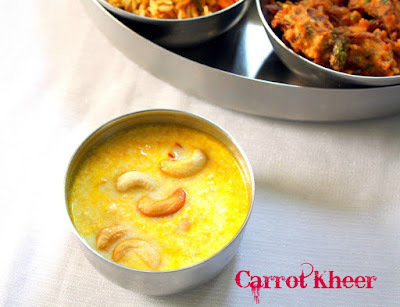 I was surprised at how easy it was to make Carrot Kheer. This is surely one of those quick sweets you can make if you are short of time. Wash and clean the carrots, grate and keep aside. 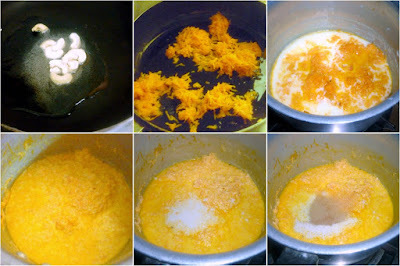 In a nonstick pan, heat the ghee and saute the grated carrots till it is cooked, rather the raw smell leaves. This takes about 5 -7 mins while stirring continuously. Soak the cashew nuts in hot water for 10 mins. Then grind to a smooth paste. Keep it aside. Soak Saffron in 2 tbsp of warm milk. Boil the milk, when done, simmer and continue boiling for a couple of minutes. Then add the cooked carrot and combine well. Simmer for 5 - 7 for the carrots to get cooked. Then add the cashew paste and bring to boil. Next, add the sugar and mix. Simmer for a couple of minutes for the sugar to melt. Finally add the cardamom powder, saffron milk. And remove, garnish with roasted cashews. The original recipe called for the carrots to be pureed and added. I rather wanted to feel the carrot texture and it surely turned out awesome. The measurement I have given will yield more, so scale down to 1/2 cup and proceed.